I always have, and always will, respect “embargoed” information. It’s part of Journalist Ethics 101, just like crediting/linking to original source material, not quoting more than “fair use” amount of copyrighted material, etc. Over the years, I’ve found that – ironically? – bloggers have been far more scrupulous about these things than the corporate media has tended to be. 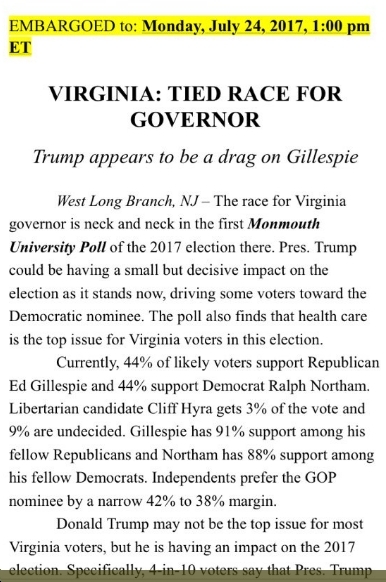 In this case, the following poll by Monmouth University was tweeted out by the Virginia GOP and others well prior to 1 pm, but again, I respect embargoes and other forms of journalist ethics, so I held this until 1 pm. As for the substance, this one’s surprising to me, as almost all the previous polls in recent months have had Ralph Northam up significantly (e.g., 11 points in an April Quinnipiac Poll; 11 points in the May Washington Post poll; 8 points in the June Quinnipiac Poll). So, not sure if this is an “outlier,” or whether this one’s accurate and the others all were off, or if something’s changed since the primary…or what. But the bottom line, no matter what, is that Virginia Democrats absolutely should not get complacent about this election, that we need to assume it’s neck and neck and act accordingly. Given how crappy the polling has been of Virginia (other than the presidential race, which was pretty good) in recent years — for instance, Mark Warner was supposed to crush Ed Gillespie in 2014, but barely squeaked by with a small win — I wouldn’t put a great deal of stock in these things, but still, I guess they’re worth noting for the record, if nothing else. P.P.S. Interesting that only 26% of Virginia voters say that Donald Trump is a “major factor” in deciding their vote for governor. Also, when asked, “If Trump was not a factor in your vote choice, who would you support for governor,” 45% say Ed Gillespie and 40% say Ralph Northam — that’s scary. Oh, and only 3% say they watched the first gubernatorial debate, held this Saturday at The Homestead and live streamed by PBS. Lame.